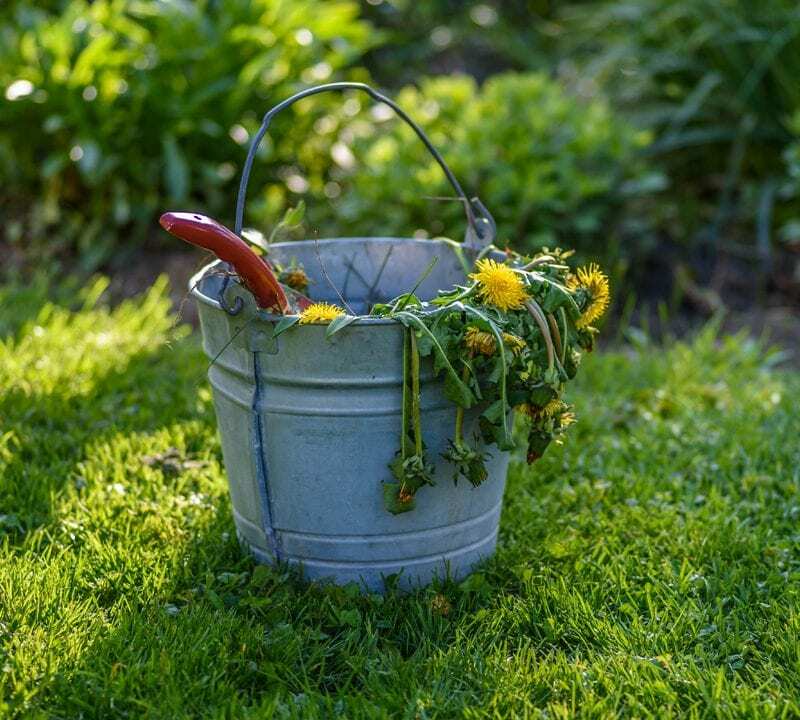 Environmental Turf's innovative lawn care programs can beautify your residential and commercial landscapes so you can spend time outside having fun instead of being stuck doing yard work. 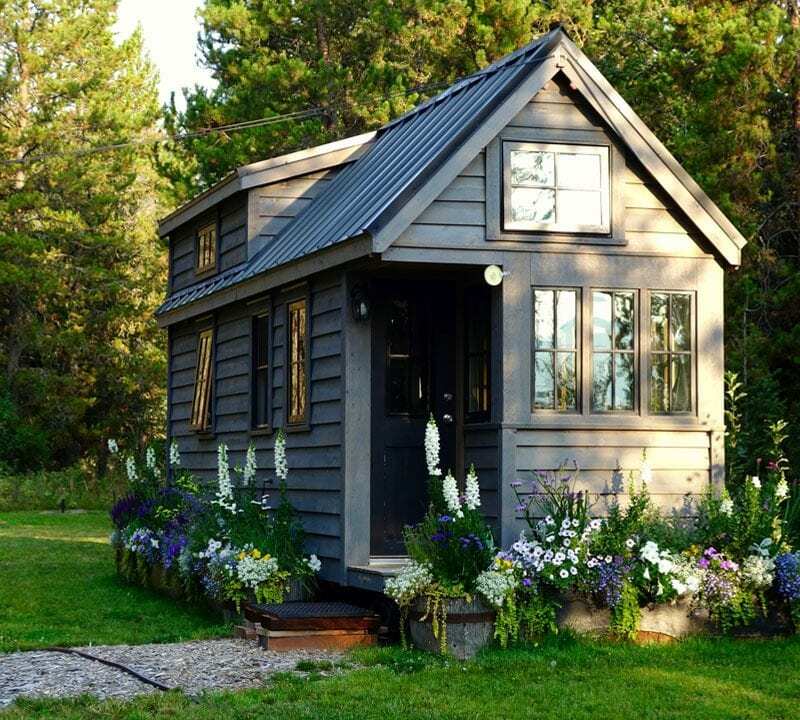 Compacted soil and thatch leave your yard looking worn, dull, and sparse. 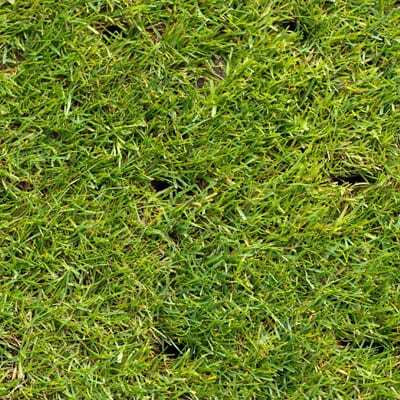 Our core aeration and overseeding applications can redistribute air, water, and vital nutrients for noticeable results. Your residential or commercial landscape beds play a vital role in your property's overall visual appeal. 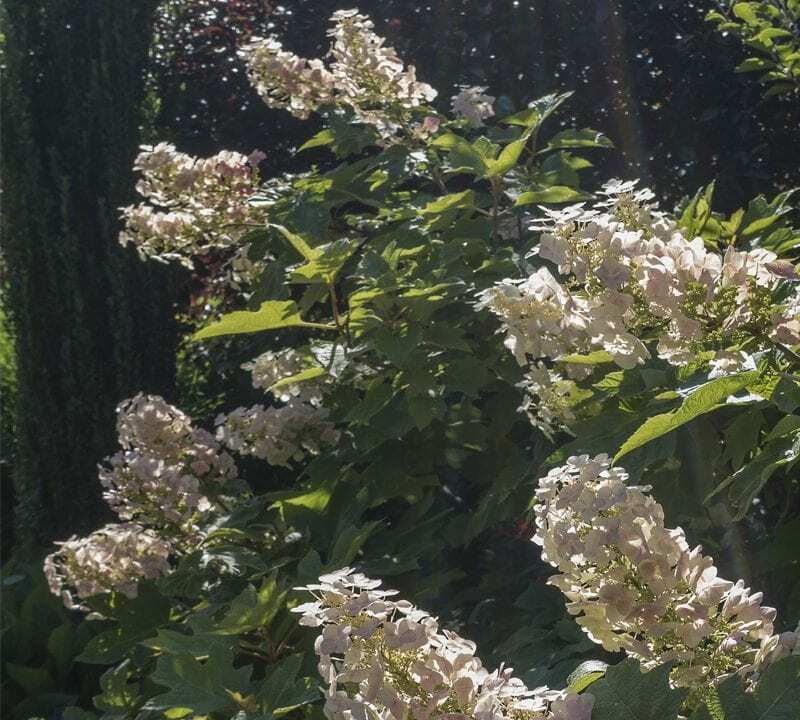 The ornamental plantings in your yard require vigilant care and protection to keep them healthy all year long. 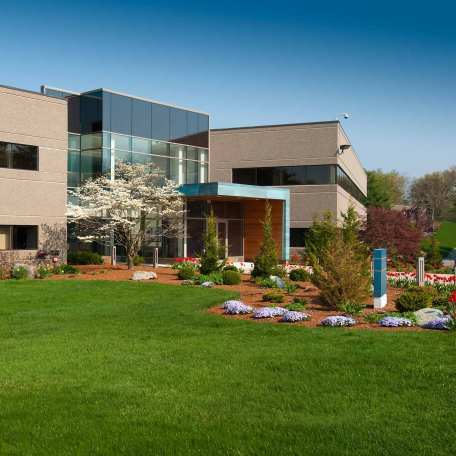 Environmental Turf Management has firsthand experience safeguarding the trees and shrubs in our region against a multitude of potential threats and diseases. Our annual program optimizes the health and longevity of large plants in all your beds and gardens. Fire ants are a major cause for concern in Georgia. While it may feel like these nasty bugs have always been here, fire ants are actually not indigenous to Atlanta. Many people don't realize just how much damage a single mole can cause. 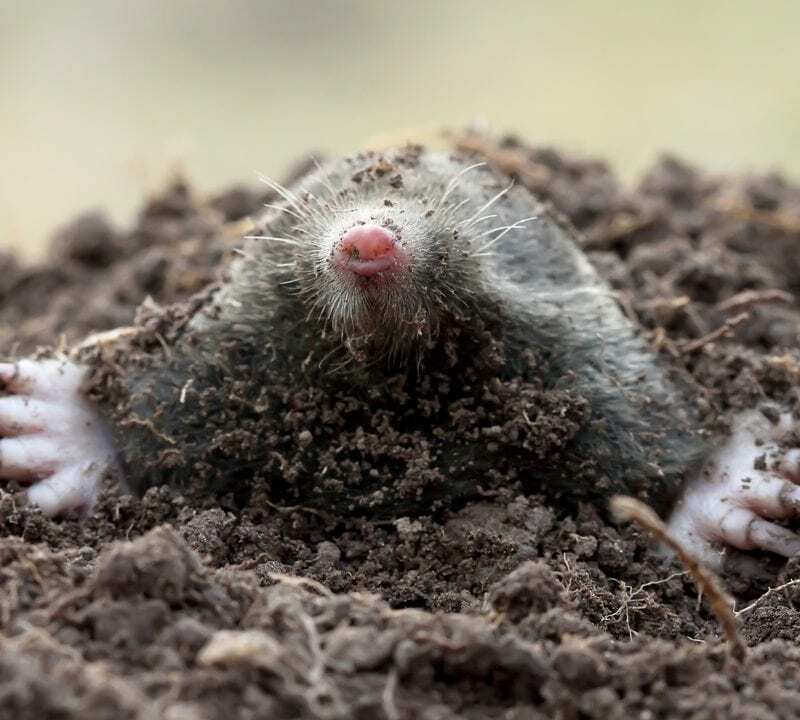 When left untreated, moles create an underground tunnel system that destroys the soil's ecosystem and root strength. We offer various strategies to target your mole and effectively take your lawn off its menu. Some bugs are good for our grass – and some are not. Environmental Turf's technicians are trained to know the difference. Grubs, armyworms, fire ants, and even fleas and ticks – Environmental Turf can target the insects that want to harm your lawn (or harm you) to exterminate adults, larvae, and nests. View the area we service. 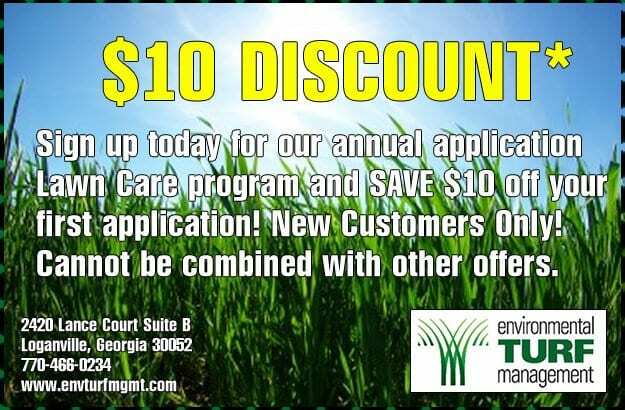 Sign up today for our annual 7 application Lawn Care program and SAVE $10 off your first application! New Customers Only! Cannot be combined with other offers. 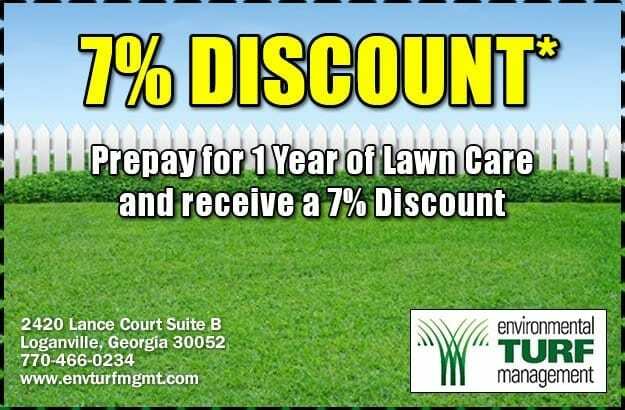 Prepay for 1 Year of Lawn Care and receive a 7% DISCOUNT! Cannot be combined with other offers. Our Fire Ant Control application will keep your lawn free of fire ants for 12 full months… GUARANTEED!! 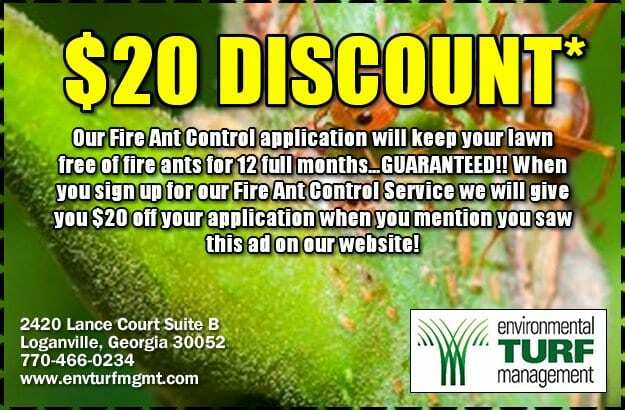 When you sign up for our Fire Ant Control Service we will give you $20 off your application when you mention you saw this ad on our website! Cannot be combined with other offers. Environmental Turf Management has been in business since 2000. We are a local, family-owned Atlanta lawn care company. We have professionally trained and licensed technicians and we take pride in delivering a quality service with excellent results. We can help you establish and maintain a beautiful, healthy lawn. Contact us today and we will be happy to come out and give you a free, no-obligation lawn care analysis. 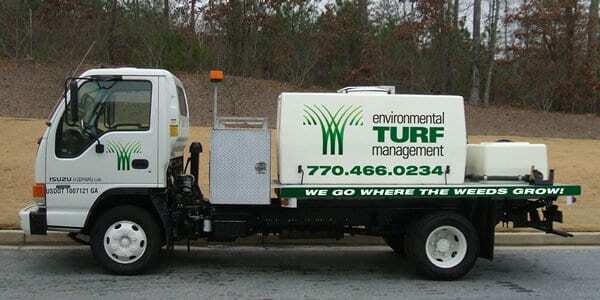 Environmental Turf Management is an Atlanta lawn and turf care company that uses expert lawn care services & techniques and careful planning to improve and protect your lawn. We realize that all lawns are unique, so we personalize a lawn plan specifically for you and your lawn. 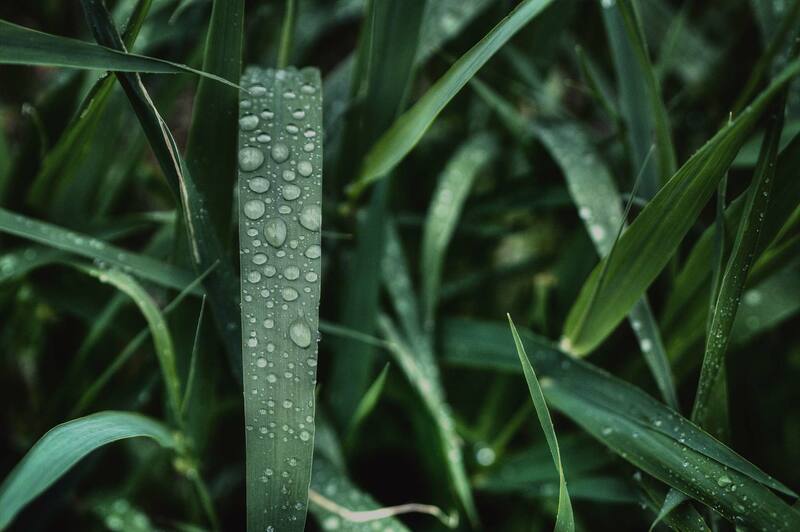 You may not know what your lawn needs to be healthy again, and it may be difficult to decide what procedures you should take to improve your lawn. Our professional technicians will know exactly what to do for you and will come work with you and your lawn personally. If you have any questions for concerns please feel free to get in touch! In early August, with a good reference from a trusted source, I called Sean Kurt for help and service to our lawn. We needed fertilizer and strong weed control. Your sales manager, Bob came out promptly and gave a most competitive estimate and firm recommendation on treatment needs. He was professional and very knowledgeable. Three days later, Marty came out on a rainy Saturday with the first application of fertilizer, with weed control to follow on a better day. On September 9th Chris, your Maintenance Manager, came out with Marty to assess needs and applied the promised weed control, which has showed definite improvement with the first application. Now this is what I call professional service. You have my compliments. Prompt responses from all. I am very pleased as your new customer to have your company support. Since we began using Environmental Turf several years ago we’ve seen quite an improvement in our lawn. The weeds are gone and grass has become much thicker and greener than ever before. We always appreciate the helpful advice and great service and have recently recommended them to several friends. Thanks for everything and keep up the good work! We’ve been using Environmental Turf now for about two years. The service has been great and my yard looks wonderful! 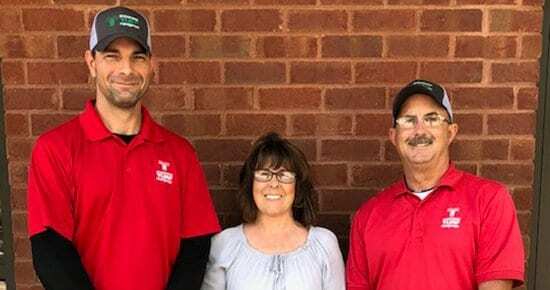 The Loganville High School Baseball Program has utilized the services of Environmental Turf for the past three seasons. 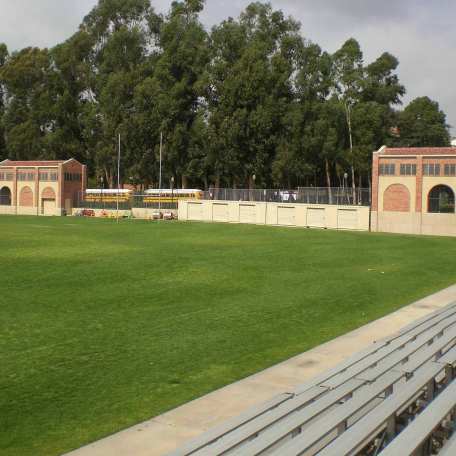 The Fertilization and Weed Control program provided by Environmental Turf has created a healthy playing surface. Owner Sean Kurt’s professional understanding and attention to detail helped Red Devil Field to become the 2010 Georgia Dugout Club AAAA “Field of the Year. I highly recommend Environmental Turf for your lawn needs.